What is a balloon valvuloplasty? 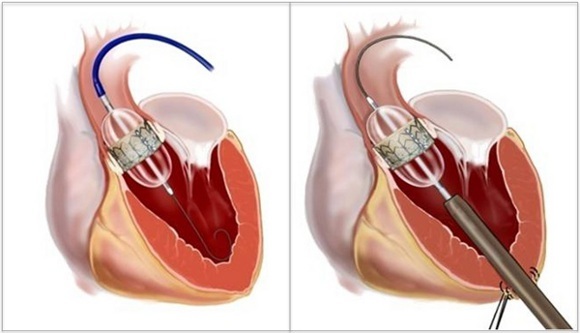 A balloon valvuloplasty is a procedure done to open a heart valve that is abnormally obstructed or narrow (stenotic). It is also called a valve dilation or a balloon valvotomy. How is a balloon valvuloplasty done? The procedure is performed while your child is under a general anesthetic. This means that your child will be asleep during the procedure. During the catheterization, the doctor threads a special catheter through your child’s blood vessels to the valve. The team takes X-ray pictures and measurements of the valve. Then the team threads a deflated balloon on the tip of the catheter to the narrowed valve. The balloon is then inflated to open up the narrowed valve. Sometimes a second larger balloon is used to dilate the area further. Then the balloon is deflated. The doctor takes out the balloon and catheter and covers the cuts on your child’s leg with a bandage. Heart valves are like gates that control the flow of blood between the upper and lower chambers of the heart, as well as the flow out of the heart.